While the Christmas tree is coming along slowly but surely, I at least got the color pallet figured out. Instead of a red, white, and blue American flag holiday home, we now have turquoise, silver, white, and red. Nice huh? 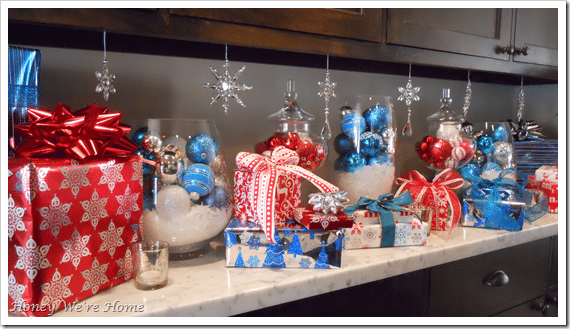 Here’s a little preview of those colors in a playful, festive vignette I put together in our bar area. 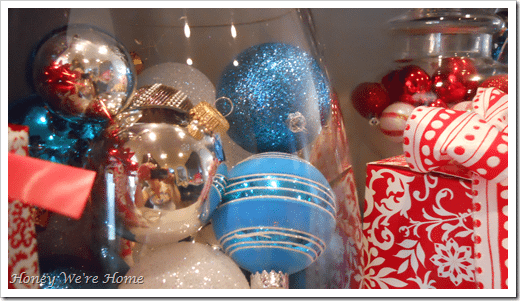 First I filled the glass vases (from Target and Home Goods) with faux snow and ornaments. Then I wrapped “presents” and made a few bows. 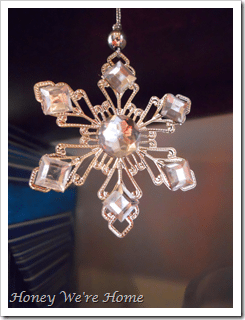 Snowflake ornaments from Hobby Lobby hang from above. Would you believe I did all of this and snapped some of the photos during James’ afternoon nap?! It’s true! 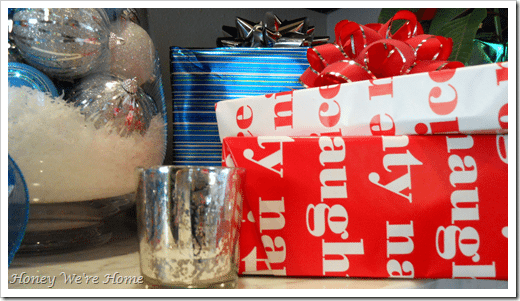 Halfway through with wrapping paper and ribbon everywhere I started thinking, “He’s gonna wake up any minutes and be all over this!” But no:) I love this “naughty” and “nice” gift wrap I found at Wal-Mart last year. The other wrap is from Hobby Lobby and The Container Store. You say it doesn’t snow in Texas? Oh, I forgot to mention that Jimmy picked up a few poinsettias at Home Depot over the weekend. See that little guy peeking out at the end? 🙂 I’m sharing this post with Rhoda, Queen of Southern Hospitality! and my girl Nicolette at Momnivore’s Dilemma. I love all your holiday ideas! My husband and I both agree that you have our favorite house 🙂 It is GORGEOUS! Looks so great. I love the turquoise and blue ornaments. So pretty. Lookin' festive girl! Looks beautiful! I am impressed that you got it all done while the little man was napping. I never seem to get much done while Aidan is napping… I swear they always know when we are starting something and choose to wake up at that moment! SO pretty! The colors are unexpected and look fabulous. Also love the new picture of you and your little guy, he is such a doll! See why I miss those naps? You can either waste them or take advantage like you did. This is so cheery and fun and I love the snowflakes coming down! im loving that festive modern color palette! That looks great! I need to get some fake snow! Love the color scheme!! Very pretty! I love it! And, I love your color choices. The turquoise really pops!! I love faux snow!! How pretty! I love your color scheme. Very festive! You accomplished a lot during nap time. Your packages are beautiful. Wrapping gifts is one of my favorite things to do. Fun AND pretty. I am impressed you got all that done during naptime! Love it! Gorgeous! I've used the same colors this year only not so bright. 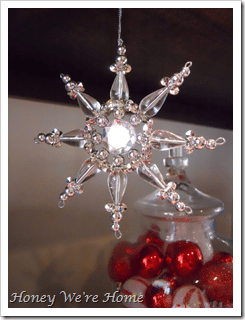 I have to say, though, I really love the shiny:) The hanging snowflakes look really pretty too!! I love the touches of turquoise. So pretty Megan! Megan this is so delightful!! 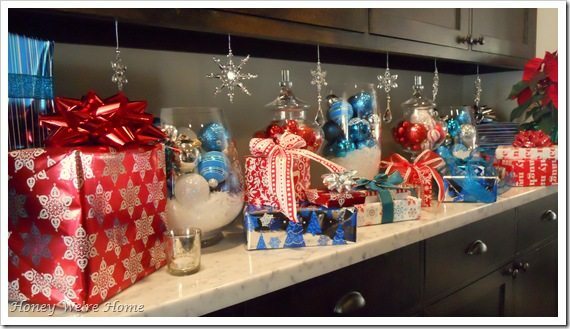 I love to see what everyone is doing for holiday decor! Wow – you've already done so much with your christmas decor. Putting us mere mortals to shame. Love it! What great colors!!! One day I'm going to get away from my traditional colors. Megan, it's beautiful! I love this color palette, so fresh & modern too. Love it all.Glad you are going to join the vignette party on Thurs. This is so much fun! What a fun idea, Megan! Way to put the bar to use! The snow flakes are my favorite part (: I also like the red white and blue color scheme. What a great idea! And how awesome to have the bar space to a do a display like that. That faux snow is from Pottery Barn for $2.50. I got it on sale for 75% off during the "after Christmas" sale- love those!! OH it is so pretty and festive! I love! 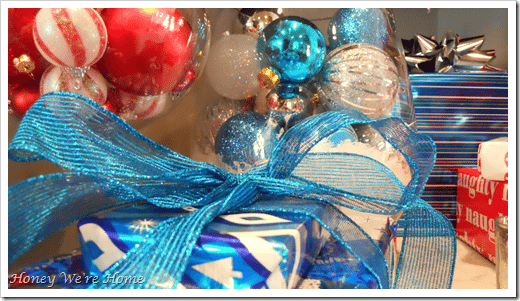 Loving the colour scheme too – so festive and sparkly! This looks gorgeous – a good naptime's work!! My BFF used tourquoise and red for her wedding this past summer and it is my favorite color combo! I think the colors really accent each other well! 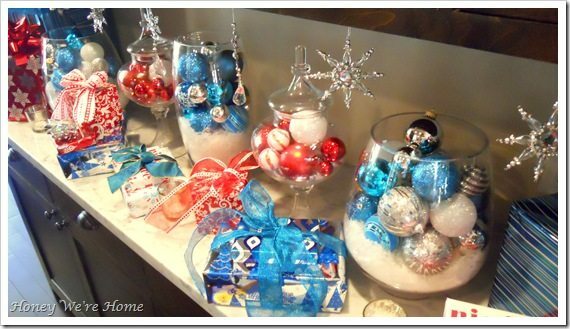 I love the idea for Christmas! Very pretty! Love it! 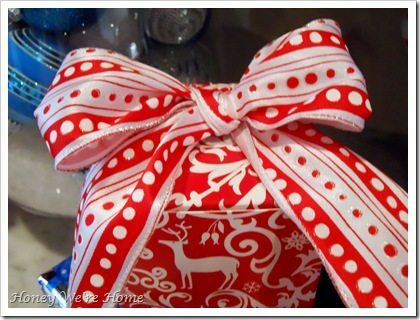 Where did you buy your ribbon? I'm on the hunt for purple and gold. Ahhhh! Love it! So pretty! Good choice with the colours!! This is flipping spectacular!!! Ok…tell me my dear…what camera do you use? I am in need….ugh. It has been so dark here lately with all the rain. Your pics and the colors — FABULOUS. I am NOT surprised…you drip with style. Hey I did my mantle today during James' nap…my James anyway…it was awesome he woke up as just as I finished. 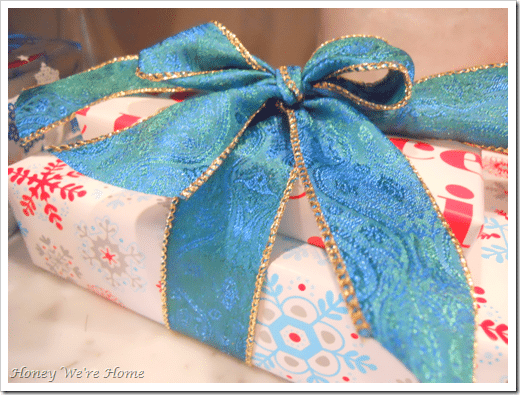 I love the colors you have put together and the wrapping paper is adorable. BEAUTIFUL!! Everything looks great!! I love Christmas!! You took serious advantage of naptime!!! 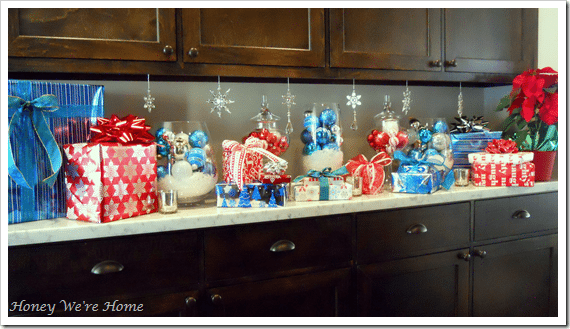 Way to knock out a huge project….looks so pretty and festive! Wow!!! Love the vignette! Beautiful job!! Would you mind linking this up to my very first link party? I love it! Hi, I'm a new follower from Creative Juice Thursday. Your vignette is beautiful. Stop by to see my very easy, kid friendly crafts. Thanks for linking to Creative Juice Thursdays, Megan! for all you mamas out there reading this blog. LOVE! This is my color scheme for my tree this year! Look so great! Gorgeous! LOVE the colors and all the sparkle! Anne at Oh My Yes! I love the pretty and vibrant colors, and esp. how they look on the marble counter. Cheers!